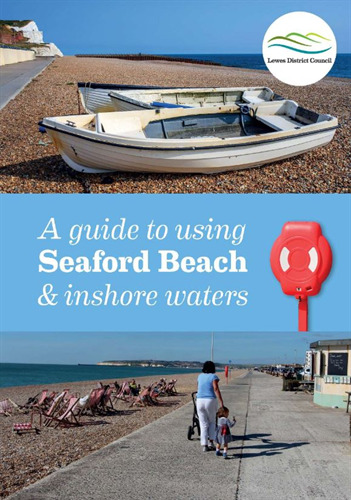 Seaford Beach & Inshore Waters Guide Released! A new guide that provides a host of information about Seaford beach and inshore waters for visitors and local residents has been launched for the summer holidays. It is available from the kiosks on the seafront, the Lifeguards, the Tourist Information Centre on Church Street and electronically. Councillor Lindsay Freeman, Mayor of Seaford said: “I am thrilled that the Town and District Council have been able to work together with the Seaford Lifeguards to revitalise and update this leaflet. Seaford’s beach is one of the town’s key assets and loved by so many, it is so important that the Councils are raising awareness on beach safety and making that information easy to access. A big thank you must go to Lewes District Community Safety Partnership for its grant to cover the cost of reprinting the leaflets and also to Seaford Lifeguards for their continued presence and commitment patrolling the beach. Families, couples, fishermen, water sports enthusiasts, walkers, dog walkers and swimmers alike can all enjoy what’s on offer from Seaford Bay, and safely!”. the beach for a variety of recreational activities including sunbathing, swimming, boating, and fishing. Look out for the Lifeguards in their bright yellow shirts along with their support team in red, who voluntarily provide thousands of hours to protect and help visitors and residents throughout a busy summer season. Seaford is a lovely seaside town that has a friendly atmosphere with the majority of the seafront offering 12 hour free parking. There are shops that provide everything needed for a day out and the town is a short walk from the beach. Restaurants, cafes and pubs all within a short distance of the beach provide good food and a variety of choice. Lewes District Council replaces a large number of lifebelts each year because of vandalism or theft. It is an offence to interfere with public rescue equipment and fines of up to £500 are in force.